A Perfect Party, Minus One. Being the only one of your friends to have the bad cupcake of the bunch is like being the only kid in class who wasn’t invited to the party. You are stuck hearing all the wonderful fun things that happened, while crying on the inside that you weren’t a part of it all. Okay, maybe that’s a teeny tiny bit dramatic. But I can tell you, eating the only bad cupcake is still no fun. About a year ago we reviewed Cooks ‘N Cakes located in Ellicott City, MD. At the time, our thoughts on their cupcakes were just so-so. Shortly after, Cooks ‘N Cakes contacted us explaining that they made some changes to their recipes and would love for us to come back and give them another try. Fast forward to about 8 months later—time really does fly by—and we finally made it back to their shop. Excited to give them another try, I selected three new cupcakes and one Coffee Craze, which we had tried previously. I knew then that I would divide the cupcakes among us Crusaders, plus our good friend and Guest Crusader, Miss Beth Lacey, who I would be seeing that afternoon. 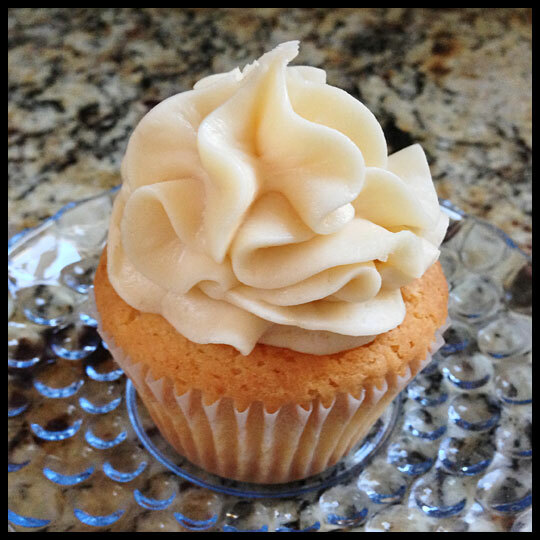 For myself, I selected True Simplicity, a vanilla butter cake with Madagascar vanilla buttercream frosting. 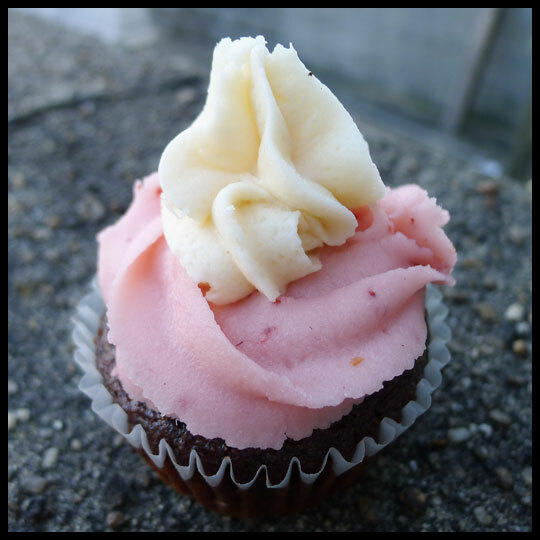 I hate complaining about a bad cupcake almost as much as I hate eating it in the first place, but there is really nothing good to say about it. The cake was so dry that it actually crumbled like a cookie. The flavor would have been good, but there was no way to get past the dryness and the frosting was just okay. In my opinion, it didn’t contain enough vanilla flavor and had way too much of a confectioner’s sugar aftertaste. When buying cupcakes, normally I come from the mindset that “you win some, you lose some,” but I was actually upset that I spent $2.50 on this. I immediately texted Jenn, Elisa, and Beth Lacey to give them a heads-up that my cupcake was inedible, but to my surprise, none of them had the same reactions. That’s when I realized that, apparently, I had not been invited to the party. 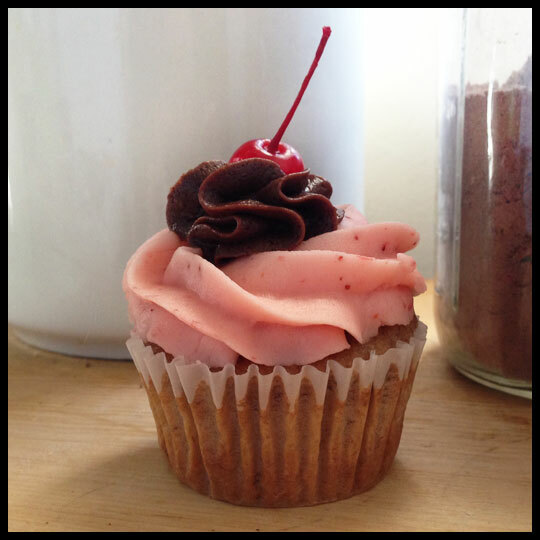 Beth Lacey said that her Split Decision cupcake (banana cake with strawberry frosting and a dollop of chocolate on top) “rocked!” and that it “totally tasted like a banana split!” Hearing this I was a bit perplexed, but relieved she didn’t have the same experience as me. Then Jenn, who had tried the Coffee Craze before, said that it still had a great aroma and a nice strong coffee flavor. She added that the frosting was nice and smooth, but that the chocolate cake was just basic and nothing really stood out about it. So apparently my cupcake was a dud, while everyone else’s wasn’t. I’ve recovered from my $2.50 loss, but am not sure that I’ll be visiting Cooks ‘N Cakes anytime soon. Their location isn’t really convenient to my home, job, or family and friends, and with a cupcake that was as bad as mine was, I just can’t get excited about another visit. For Cooks ‘N Cakes sake, I really do hope that my cupcake was merely a random fluke. I would hate to see a small business suffer because others have had similar experiences. So, if you are reading this, I encourage you to go and try their cupcakes for yourself, just maybe stay away from the Vanilla? 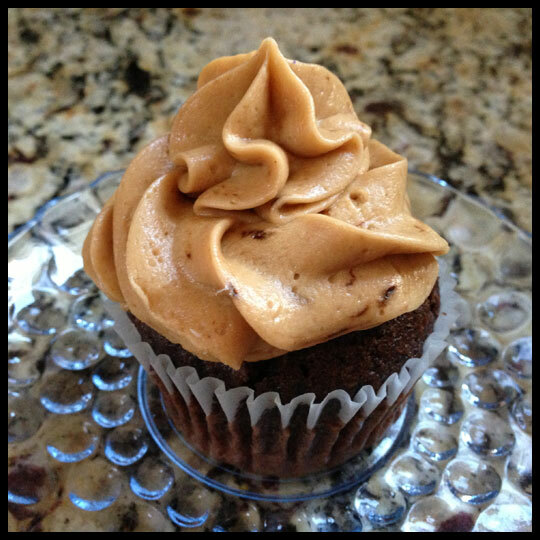 This entry was posted in Cupcakes, Maryland and tagged banana, Banana Split, banana strawberry chocolate, coffee, Cooks 'N Cakes, Cupcake, ellicott city, maryland, Split Decision, strawberry chocolate, True Simplicity, vanilla by Stacy. Bookmark the permalink.